What Hollywod knows is what all brands should know: that co-branding is a powerful catnip to audiences who each get their treats. What you may remember is that in the film “Elizabeth” Eddie Redmayne played the part of her assassin in several scenes in which his extraordinary screen presence was revealed to the audience. I sat up and took notice then and then upon his portrayal as the young lover in Les Miserables, it was clear a star had been born. 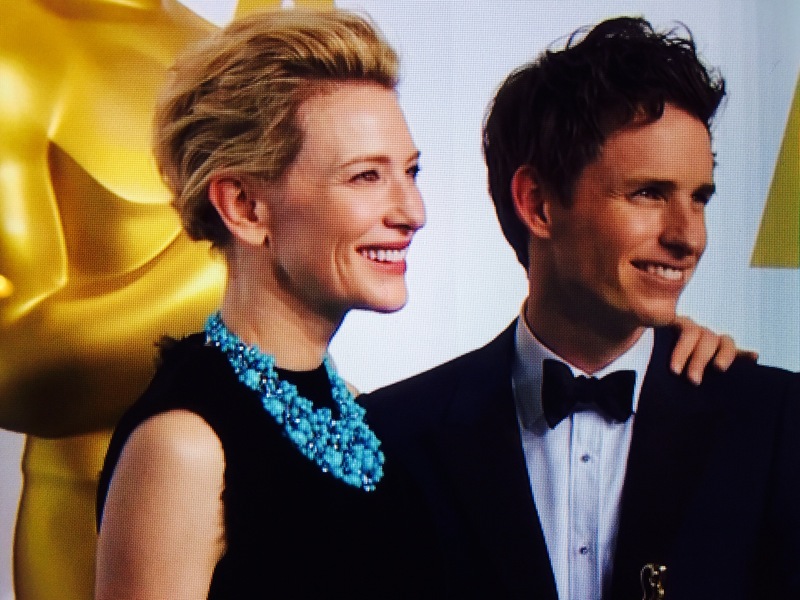 The significant photo of these two unique talents (Kate Blanchet and Eddie Redmayne) confirms the power of how one personal brand can support another. Mega-watt star power when it is shared makes it even more powerful. Witness the duo of Brad Pitt and Anglela Jolie dubbed “Brangolina” by the press. Separately they are influential but togeteher they are a double powerhouse. Brands can enlist a co-branding strategy in simple and complex ways that borrow from each other for the same ends: to empower them both into creating a new brand that builds on the strength of both exisiting brands. But the moment in this photo is really the support of one friend to another – and seeing this is Hollywood is truly special.